Scottish Football could be set for a new league sponsor ahead of the new season. Amid speculation that a deal is close the Scottish Premier Football League have told BBC Scotland that "talks are ongoing" to secure a new backer for the four divisions. They also say they are "hopeful of an announcement being made in time for next season." The league have been without a sponsor for the past two seasons. The Clydesdale Bank sponsored the Scottish Premier League up until their contract expired in 2013, electing not to renew their £2m-per year deal. Ahead of the this year's Scottish League Cup semi-finals and final the QTS Group agreed a three-game sponsorship package to cover the three Hampden clashes, while Petrofac Training Services have sponsored the Challenge Cup this season. 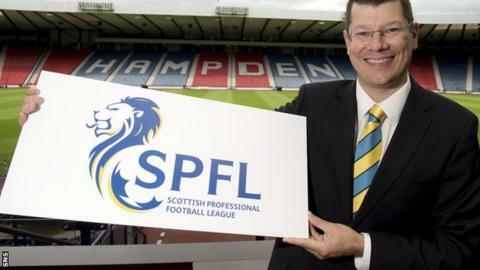 In January, SPFL chief executive Neil Doncaster told BBC Scotland: "The work continues to find the right sponsor at the right value. It's very easy to give any property away. We appreciate the real value there is in the title sponsorship. "Any big sponsorship deal takes a long time to put together. "For so much of the time that we've been marketing this property, there's been a huge amount of uncertainty hanging over the Scottish game, initially from the merger when the Scottish Football League and the Scottish Premier League came together in the summer of 2013. "Up until that point, we couldn't go out to any potential sponsor and tell them what they would be sponsoring. It was only come the merger last summer that we were finally able to nail down what it was we wanted to attract finance for. "That's certainly been an issue and the continuing uncertainty generally within the game hasn't helped either."